The ‘Better’ Emini charts look a little different – not your traditional moving averages, Fibonacci retracements, RSI and MACD. In the video above I run through how to setup one of the ‘Better’ Emini charts and how to read the signals from the 3 non-correlated indicators (Better Sine Wave, Better Momentum and Better Pro Am). I use TradeStation for my charting platform, but the same principles apply if you use NinjaTrader or MultiCharts. 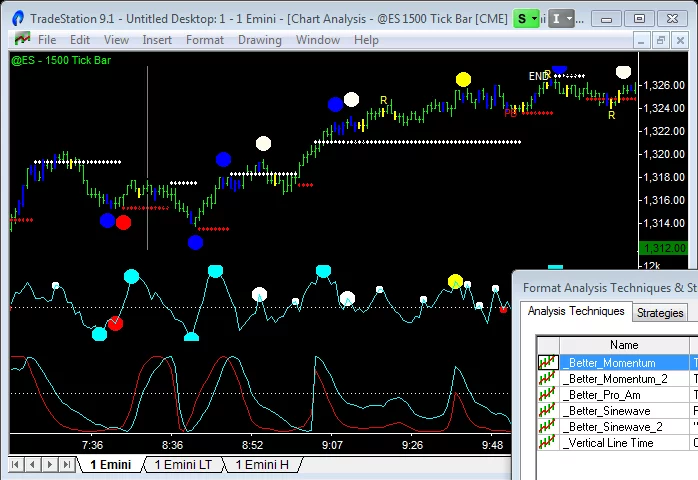 This combination gives you real-time Emini data for your day trading charts and market depth data for the TradeStation matrix to execute trades. However, if you are not a TradeStation futures trading customer and only use TradeStation for charting (as I do), then this combination is not available to you. In this case you’ll have to subscribe to the “Standard Options: CME Real-Time Data Package #1” that costs $40 per month. In addition to the real-time Emini data I also follow a number of other markets and indices. I subscribe to real-time indices data for S&P, CBOE, Russell and PBOT. Plus real-time data for NASDAQ, NYSE and OPRA. Most of these other data feeds cost $1-3 per month. My total monthly data feed charges are $55. It’s a cost of doing business and part of the entry fee for being an Emini trader – so I live with it. TradeStation recently updated its market data pricing. The changes have been incorporated in the suggestions in this article. But if you’d like to know more, you can check out: TradeStation Data Feeds You Should Subscribe To. For my day trading I use the @ES TradeStation symbol that plots the Emini continuous contract. This takes into account symbol rollovers and incorporates day and night session trading. For tracking longer term trends on the Emini I use minute charts (e.g. 135 minute chart). In these charts I usually just use the day session data – and the TradeStation symbol is @ES.D. In addition to these 3 charts I also have a chart with the MTF (multiple time frame) versions of the indicators on them. The advantage of this chart setup is have just one chart – 500 tick Emini – with all 3 timeframe signals on it. It makes for simpler chart reading. What if my charts don’t match yours? Tick data feeds don’t match between different platforms and data providers. Unfortunately this is just a fact of life. You can find more information and the reasons why at the bottom of the Tick Charts article here. Corrupted or compressed historical data saved to your cache. Data feeds can go down, data can “burst” during quick markets and saved data can be corrupted or compressed. Deleting the data cache and re-loading data should help. Different time zone or session times settings. Tick charts start counting afresh at the beginning of sessions. This causes differences, particularly in longer time frame tick charts. Stick with the exchange time zone and default session times. What settings should I use for NQ, YM, TF & EMD charts? I prefer to trade the Emini (ES) because of the higher volume and more Professional activity. You might consider taking signals off the Emini (ES) chart but placing orders on your preferred index futures (NQ, YM, TF or EMD). What settings should I use for Forex charts? Rather than charting the “cash” Forex markets, chart the Forex futures, traded on the CME Globex exchange, instead. Volume data is included in the CME data feed but is not available for the “cash” Forex market. There is a detailed video on how to use the ‘Better’ indicators for Forex trading here. The table below summarises the visual symbols I use on my Emini charts. The typical bullish/Long trade setup is shown below – starting at the top and progressing down. A typical bearish/Short trade setup would be the reverse of this sequence shown below.